Hello creative friends! I have a "Bittersweet" card to share with you today. 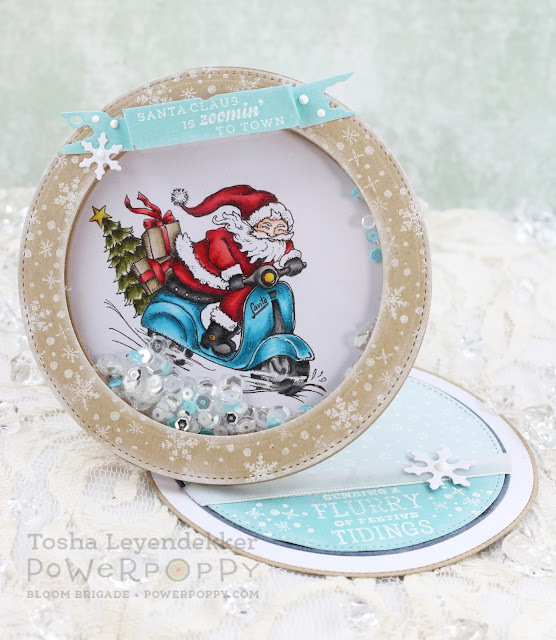 The 25th of this month, Power Poppy released a new digi stamp called Bittersweet Wreath with two "Thankful" sentiments. An absolute charming set for Thanksgiving. I thought, why can't it be a Christmas wreath too? Or a Spring wreath, or even a Summer Wreath. This image is so versatile! Being me...I immediately thought "white". So, I got out my Minc Machine and got to work Minc'ing this image with White Foil onto Kraft Cardstock. I then colored the berries with a red colored pencil and diecut it using a die from Spellbinder's Blossom Tags and Accents dies. I used a white colored pencil to color the embossed dots that were around the flower shape. For the tag, I used a new Power Poppy sentiment from the Fully Stocked stamp set. I stamped it with Versamark onto black cardstock and embossed it with detailed ep (Ranger) Lastly, I sewed around the two panels, splattered some white acrylic paint, and added a few sequins. It actually came together pretty quickly. And for me, that is huge!! That about sums up everything for today! I hope you have a truly blessed weekend. I know I am looking forward to staying home. It's been a crazy busy week. Hey y'all!!! The day has finally arrive, and not only is the Happiest Holiday Collection available for purchase, but Power Poppy is offering a super special deal!!!! How cool is that! Marcy is so awesome!! For my final card this release, I used the Power Poppy stamp set called Holly Golightly! I adore the sweet tag that you can put any sentiment your heart desires in!! And the holly branch...exquiste!! Marcy always includes just the perfect amount of detail!! Once again, it's all colored with Copics!! Head on over to the Power Poppy Blog for all the links and more information about the store's special deals!! Thanks for all the kind comments and for stopping by! It's a delight to work with Power Poppy images, and to hear you are enjoying them too makes my heart happy!! Hello, Hello, Hello!! I'm back after a 1 day hiatus, and I am super excited to share today's card with you! 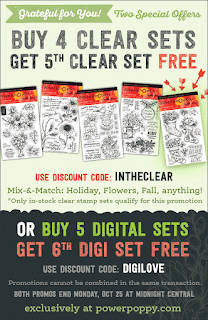 The Bloom Brigade is featuring a beautiful new stamp set called Glistening Paperwhites, and the minute I saw it, I knew it had to be Minc'd on Vellum!!! Next, I burnished the back of the image to give it texture. I feel with it burnished, it's easier for the Copic markers to adhere and blend a bit to the Vellum. There is no scientific proof of this, and I'm, by no means, an expert. I just like the way they worked after the burnishing. Lastly I added a touch (and I mean only a touch) of sparkle with my Quickie Glue Pen and Dazzling Diamonds Glitter by Stampin' Up!. I wanted the White Foil to be the focal point. Marcy's images have such fabulous detail, and Minc'ing with the Foil captures every little detail, no matter how minute. If you click on the image, it will zoom in and you can see the detail and sparkle even better. Now, glue shows through Vellum, so I just used some metal clips to hold my Minc'd Vellum piece in place and sewed around the image, and added a sage green base to the back. 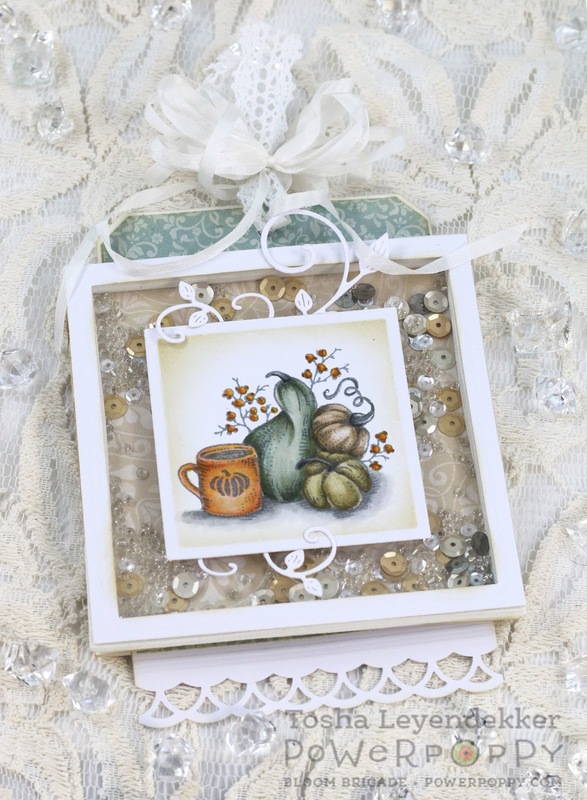 I added a sentiment, as well as one of the individual Paperwhites to the inside (embossed with white detailed embossing powder), and included a pair of white lines (that I hand drew with my White Signo Pigmented ink pen), as well as a couple of Rhinestones to finish it off. That's it for today's project my friends!! Tomorrow is THE DAY!!! 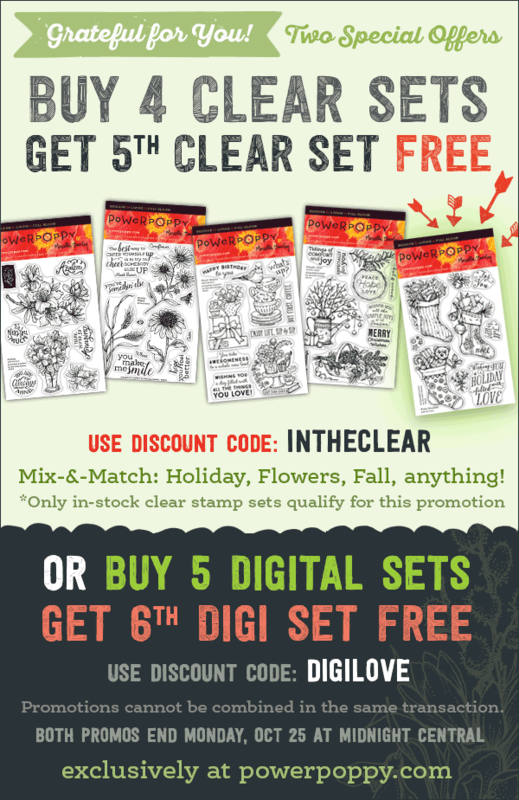 All 5 new Power Poppy stamp sets will be available for purchase. Now tell me...can you choose just one? I didn't think so. Each one is so unique and charming. I have one more project to share with you tomorrow, so please drop by again. Hello creative friends!! Have you been enjoying the peeks? Are you ready to be enabled some more? The set we are featuring today is called Fully Stocked, and it is an absolute delight!! 3 charming stuffed stockings, beautifully fonted sentiments, and sweet little extra embellies!! I chose the one that looked vintage to me, and colored it with warm neutrals with a hint of color. I wanted the focus to be the taupe and pink with a splash of sparkle. 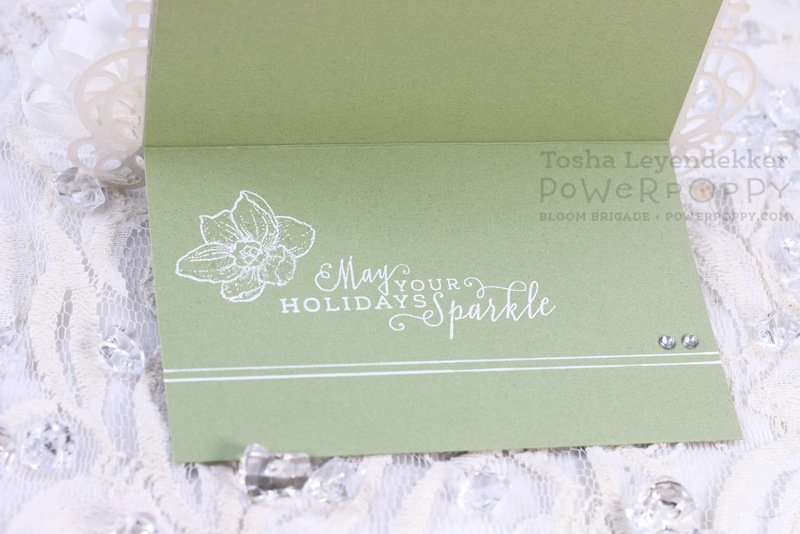 I also embossed a mini-white bag to hold a sweet little tag with a holiday sentiment stamped on it. Thanks so much for dropping by y'all!! Be sure to visit tomorrow for our last peek before the Power Poppy Release day hop. I'm back to share another Power Poppy card that I made for this week's sneak peaks. We're featuring a set called Action Santa, and, in my opinion, it's one of the most unique, fun, and adorable Santa sets out there! A definite must have for sure!! 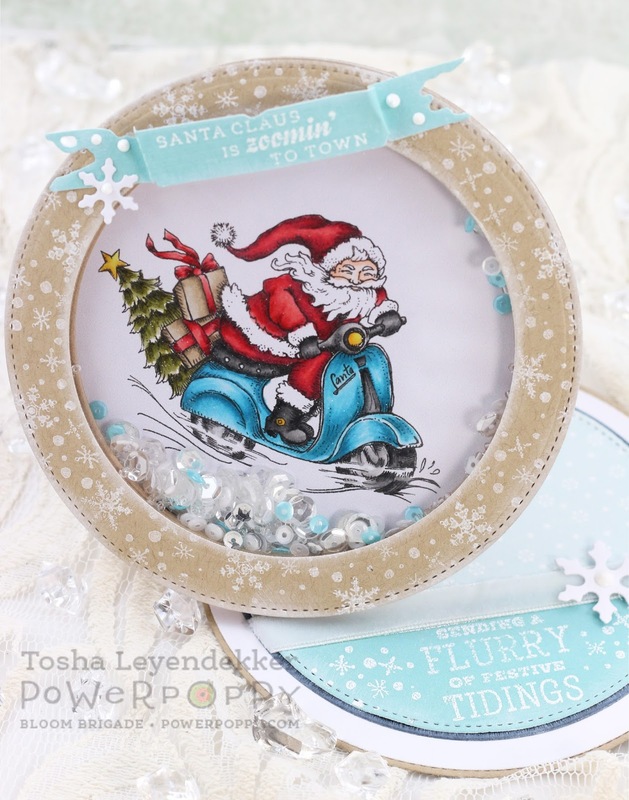 I chose to color up the Scooter Santa, because, first of all, I adore that scooter, and secondly, we actually have a blue scooter. It's more baby blue, but shoot, I'm a turquoise freak, so I had to lean more in that direction. Doesn't Santa look jollier than ever? Since this month's Power and Spark challenge is to "Make it Move", I thought it would be fun to make another shaker card in the form of a Twisted Circle Easel card. When folded, it lays flat, and when you open it up, it twists and stands on the base. This set also includes 3 little snowflakes, and little collage of flakes that I used for the frame. I added one of the little sentiments to the banner on top, and one on the inside as well. Now, a little word to the wise...it is not smart to decide to emboss after adding velvet ribbon to your card. 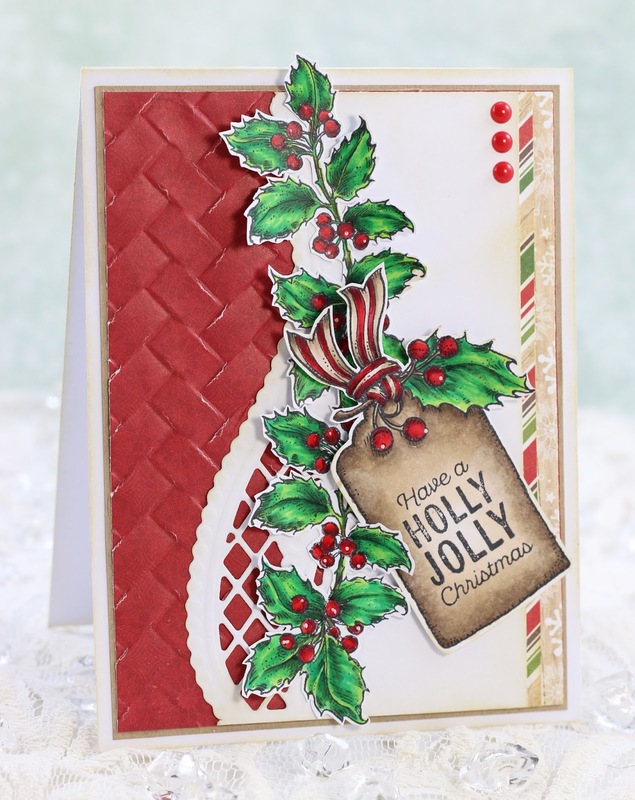 Stamping, as well as adding the powder is a challenge. Since my card was already glued together when I decided to add the sentiment, there wasn't anything I could do to fix the "splotchiness" of the embossing. It has nothing to do with the stamp itself...these babies work beautifully. It was the operator of said stamp that messed up....anyway...the sentiment says "Sending a flurry of festive tidings". Isn't that charming? That's it for today y'all!! I hope you are enjoying our Power Poppy Release Sneak Peeks. I think Marcy has outdone herself once again. I love the way her creative brain operates!! If you haven't already, you'll want to stop by the following Bloom Brigade Blogs for some more inspiration! Thanks for dropping by and for all your sweet, generous comments. I love coloring and making cards and feel so blessed to be able to do this to my hearts content. So when you kind souls use your precious time to leave a kind comment, it warms my heart. I hope you have a fabulous day, and be sure to stop by tomorrow for a peek at yet another lovely Power Poppy set! It's finally here!! The Power Poppy Bloom Brigade will be sharing sneak peeks of the new Happiest Holiday Power Poppy Collection for the next 5 days, and then....we'll share an extra inspirational hop on release day October 21!! And people...let me tell you...these 5 sets are brilliantly creative, beautiful, and full of the most delightful images and sentiments. So, grab a cup of coffee, or a delicious snack, and hop along with the Bloom Brigade to see snippets of what these 5 sets include. Today we're featuring a Power Poppy set called Simple Joys. Now, that is totally me! I LOVE the littlest, simplest things...a sweet little bird sitting on the railing of our gazebo, the velvet muzzle of our horses' noses, a sunrise or sunset, the cool, crisp air of Fall, a text, or call from one of my kids (they live over 2000 miles away), chatting with a dear friend...those to me are true joys (along with so many others). I also love, what I call, "Charlie Brown Christmas Trees". Do you know what I'm talking about? The scrawny, droopy branch tree that everyone passes by? That's MY tree!!! 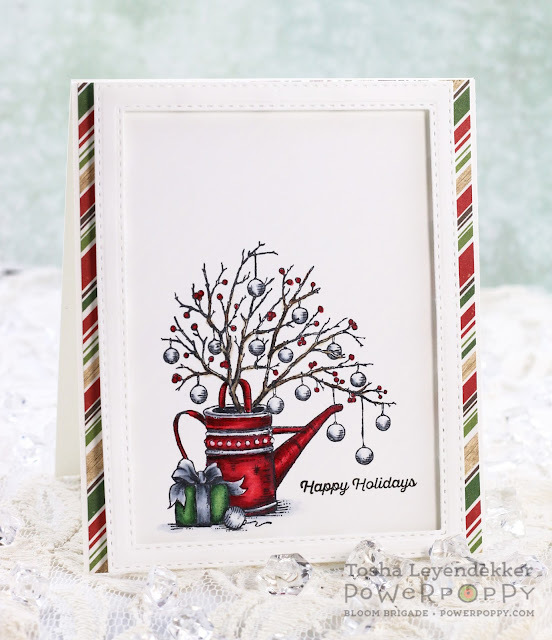 So when I saw this darling watering can with the sweet, little, ornament embellished branches...I fell in love!! I actually went traditional with this one and used red and green. I rarely do that because, frankly, I like to rebel sometimes, and that's about as rebellious as I can get...using non-traditional colors on my cards. ;) I also wanted my card to fit the feeling of this set...Simple. So I left the layout CAS, colored it with Copics and popped up a frame for a hint of dimension. That's it. Easy Peasy. Now, for some more inspiration, you will want to check out what the following Bloom Brigaders have to share. These girls do not disappoint!! That's it for today y'all. Stop by tomorrow for another Power Poppy Sneak Peek! Happy Friday y'all!!! Are you ready for the weekend? I know I am looking forward to it! 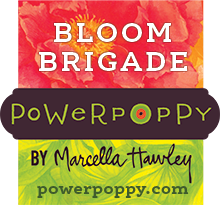 I'm also excited to share today's Power Poppy project with ya! 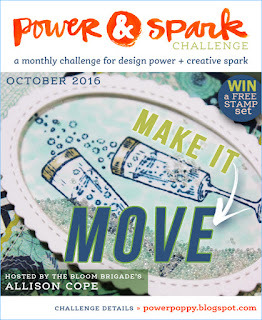 Since it's the first Friday of a new month, there is a new Power and Spark Challenge hosted by are own, dear Ally. She has challenged us to make it move. Well, I took on that challenge, and it was exactly that...A CHALLENGE!! I decided I wanted to make a double slider with a shaker main body. Okay...that was a bit ambitious. First of all, I've never even made a slider, let alone a double one. And then add a shaker on the front? YIKES!! This baby took some time. And, I have to admit...it doesn't slide perfectly. I took the instructions a bit too far. They warned not to make the plastic band inside too tight...so...of course, I made it too loose. DOH!!! But I'm happy with the look of it...even if it doesn't function perfectly. I know better for next time right? Below you can see it with the slide outs. They are actually supposed to slide out further, but, after gluing everything together, I must have had a malfunction. Since it's assembled, there is no way for me to figure out what happened. But, you can still see the sentiments (mostly), so mission accomplished. I colored the image with Copics, and aged everything with with Antique Linen Ranger Distress Ink to vintage it up a bit. I have a few mini velvet pumpkin and these two little guys remind me of them. Aren't they sweet? Before you go, I want to give you a heads up about the upcoming new Power Poppy Happiest Holiday release that will happen Oct. 21st!! This, my friends, has got to be my most favorite release yet!! SERIOUSLY!! There is quite the variety of Holiday sets that will appeal to every style and taste out there. And talk about C-R-E-A-T-I-V-E!! Marcy pulled out all the stops for this one. So, mark your calendars...peeks start October 16!!! That's it for today!! Thank you so much for dropping by! I'm honored to have you visit!